For years, marketers have told boys and girls which toys "should" interest them, instead of encouraging them to choose freely. This makes no sense. Why should we limit kids that way? 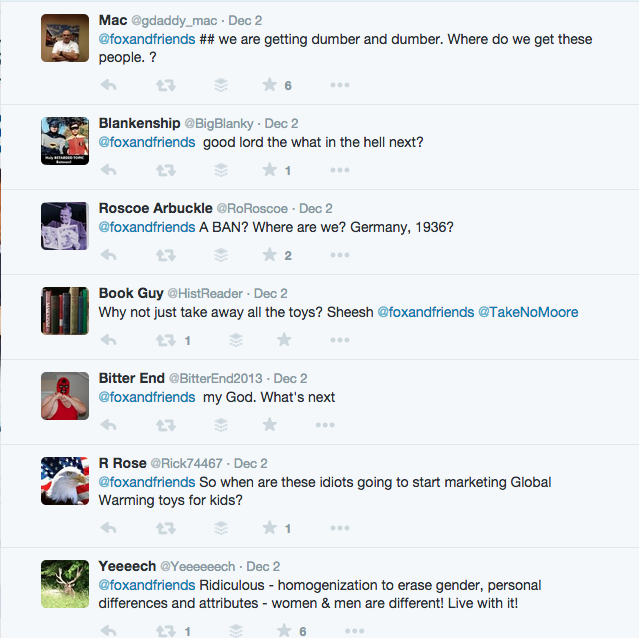 An incredible new campaign called #NoGenderDecember seeks to fix that problem. For years, marketers have told boys and girls which toys "should" interest them, instead of encouraging them to choose freely. This makes no sense. Why should we limit kids that way? 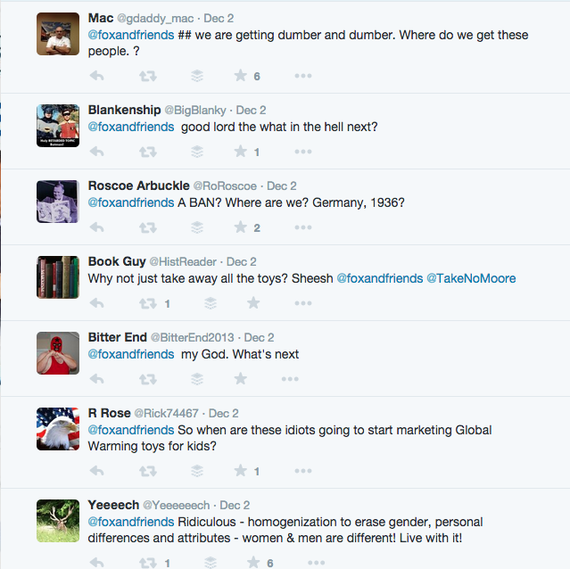 An incredible new campaign called #NoGenderDecember seeks to fix that problem. Created by Thea Hughes and Julie Huberman, co-founders of Australian not-for-profit Play Unlimited,"#NoGenderDecember offers a simple, powerful argument: marketers and toy stores shouldn't categorize toys by gender, because kids should feel free to play with whatever appeals to them. They should organize toys by theme or interest, instead. I found the message clear and persuasive, and I imagined it would be tough to find someone who had a problem with the proposal. When my colleague Professor Rebecca Hains, author of The Princess Problem, appeared on FOX and Friends to discuss #NoGenderDecember, host Tucker Carlson seemed confused and determined to portray the movement -- and feminists more broadly -- as, to use his word choice, "insane." Tucker Carlson: "A new movement sparking controversy is called "No Gender December." Consumers are encouraged to buy more inclusive, gender-neutral toys -- whatever those are -- in contrast to the Barbie Dolls and G.I. Joes you grew up with." Excuse me? I don't remember seeing anything in the campaign urging us to stop buying Barbie or G.I Joe. Did he visit the same web site as the rest of us? Was he was actually reading from notes an intern prepared on an entirely different topic? Banning toys would be terrible! Poor Tucker, how embarrassing for him. Luckily, as Rebecca is often quoted in the media about how toys are marketed to kids, she was ready to clear things up quickly. Rebecca Hains: "I really think the key point to bear in mind about this campaign is that it's not about making things gender-neutral. It's about the marketing, and letting boys shop for whatever toys that appeal to them, and girls shop for whatever toys that appeal to them -- without saying that there's such a thing as a 'boy's toy' or a 'girl's toy'." OK, it really couldn't get any clearer than that. Was it time to discuss the actual campaign now? Penny Nance: "Well, you know Tucker, honestly this is where the feminists start to lose us." Oh no, not those darn feminists again! How blasphemous they are, advocating for women to be treated with the same rights and respect as men. Penny: "They think there's this insidious plot by toy manufacturers to force little girls to play with dolls, and that's just not true. If you look at National Federation of Retailers, the top five toys for girls are dolls, it's basically not learned behaviour, it's innate. We can't fight Mother Nature, we can't fight nature and it's a great thing." Might it be just possible that the top five toys for girls are dolls because adults have been conditioned to think of them as the "natural" gift for girls? 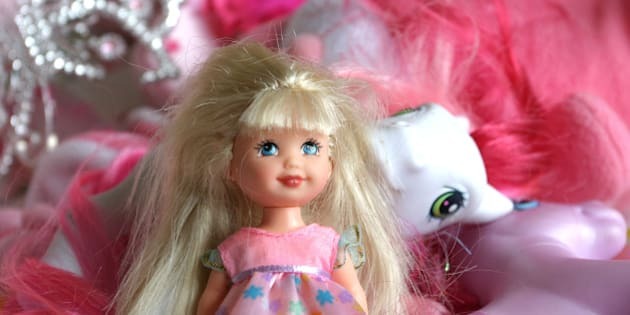 I received a ton of Barbie dolls when I was little, but found them way too boring and preferred to play sports instead. It happens all the time. Why is it so scary to allow our kids access to all kinds of interests? Are they afraid that if a girl plays with rockets she'll turn into a boy? It didn't happen to Sally Ride, Mae Jamison or Kalpana Chawla. What if a boy plays with a kitchen set? Wolfgang Puck, Jamie Oliver and Jacques Pepin sure seem to be doing alright. Tucker went on to agree that "that's how nature works" -- aligning himself with Nance, as well as Australian Prime Minister Tony Abbott, who denounced the campaign because he wants "Boys to be boys and girls to be girls." Rebecca: "Nobody that I've spoken with has actually said that they think girls should stop playing with dolls. It's more about more options for everybody. And what I found in doing the research for my book was that, unfortunately, there's a number of children -- both boys and girls -- who would want the toy that was presented in the "boys' aisle" or the "girls' aisle" and felt ashamed or embarrassed about wanting that toy. I think if you look at where chemistry sets are placed, for example, the science kits are marked as "boy toys," and craft kits are marked as "girl toys". What's wrong with those just being organized by interest, rather than by gender?" Tucker: [laughing] "So, Penny if you were to create a hierarchy of concerns in America in 2014, where would this rate?" Did you really just insinuate that this entire issue is a waste of time, despite dedicating five minutes of airtime to it? Is that because the idea of gender equality scares the hell out of you, and you aired it specifically to twist the campaign into something unrecognizable, in order to discredit feminists? Were you not, perhaps, expecting Rebecca to be so well prepared? Ending the conversation the way you did reminds me of a child who, upon failing a math test, throws his test paper on the ground and cries, "Math is stupid, anyway!" As for Rebecca, when I asked how she felt the interview went, she was remarkably cool and unruffled. "I'm always glad to share my perspective on FOX and Friends," she said, "and I was grateful for the opportunity to clarify what the #NoGenderDecember campaign is all about. I just found myself wishing that Tucker and Penny had engaged with the substance of my comments, rather than discussing topics unrelated to the gendered marketing of toys. If they'd stayed on topic, I suspect we would have found some common ground." But is common ground even what they were hoping to achieve? Doubtful. After all, how much fun would it be to watch an intelligent exchange of ideas, facts and opinions that would probably result with viewers walking away with more insight and information than before they started watching? I'm guessing that Tucker didn't think that would be fun at all, which is why this interview was more about calling out the "crazy, feminist lady" about an issue he didn't bother to actually learn about, than it was about the campaign at all.